SEE THE NEWS AND ANNOUNCEMENTS PAGE FOR NEWS OF THE CHOIR'S PERFORMANCES IN 2013! THE LAMBFOLD BENEFICE CHOIR is a body of 35 enthusiastic singers from the five parishes of the benefice who belong to either the Junior or Adult section of the choir. The Junior choir members are aged 8 - 16. The adult choir age is anything above that!!! We rehearse weekly for an average of 40 practices a year, depending upon the services we are needed for. 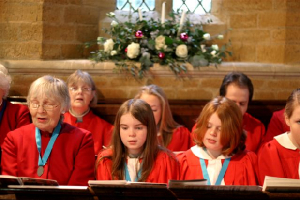 Choir practices are held at Blakesley Church on Thursday evenings. The Junior Choir starts at 7.00 pm and finishes at 8.00 pm. We sing at services around the Benefice, mainly for special services and for benefice services. We are also called upon regularly to sing at weddings in the benefice. contact Meg Pike - Choral Director on 01327 860186.